The Center for Hartford Engagement and Research invites individual students, teams of students, and faculty sponsors to collaborate with Hartford community partners on meaningful and timely community-based research projects. Opportunities are available through two programs: 1) Community Learning Research Fellows and 2) the Liberal Arts Action Lab. Apply for any Fall 2019 Liberal Arts Action Lab proposal at http://action-lab.org/apply and contact Megan.Brown@trincoll.edu with any questions. Connecticut Coalition to End Homelessness: Research and Outreach for the 5,000 CT youth who are experiencing homelessness. Apply for Fall 2019 Community Learning Research Fellows, with possible partners below, at http://cher.trincoll.edu/fellows and contact Laura.Holt@trincoll.edu with any questions. Do you have specific students that you recommend apply for these opportunities? Are you interested in becoming a faculty sponsor for a project? If so, please contact CHER Communications & Data Assistant Erica.Crowley@trincoll.edu. Find more information on both programs here and mark your calendars that applications are due March 31st. Trinity College students in Professor Serena Laws’ CLIC 290 course “Tax Policy & Inequality in Hartford” have been trained as IRS-certified tax preparers through the Volunteer Income Tax Assistance (VITA) pilot program at Trinfo.Café. Read this story by Katie Cort ‘19 about how the students are connecting their learning about tax policy with this program and meeting a real need for no-cost tax preparation in the community. The pilot tax clinic is one of several Volunteer Income Tax Assistance (VITA) locations in Hartford coordinated by United Way and generally serves people who make less than $55,000, people with disabilities, and offers tax preparation services to Spanish and other language speakers. Appointments (in English or Spanish) can be made by calling United Way’s 2-1-1 line or through the website 211ct.org. See more information about the VITA Tax Clinic at Trinfo.Café, 1300 Broad Street, by clicking here. 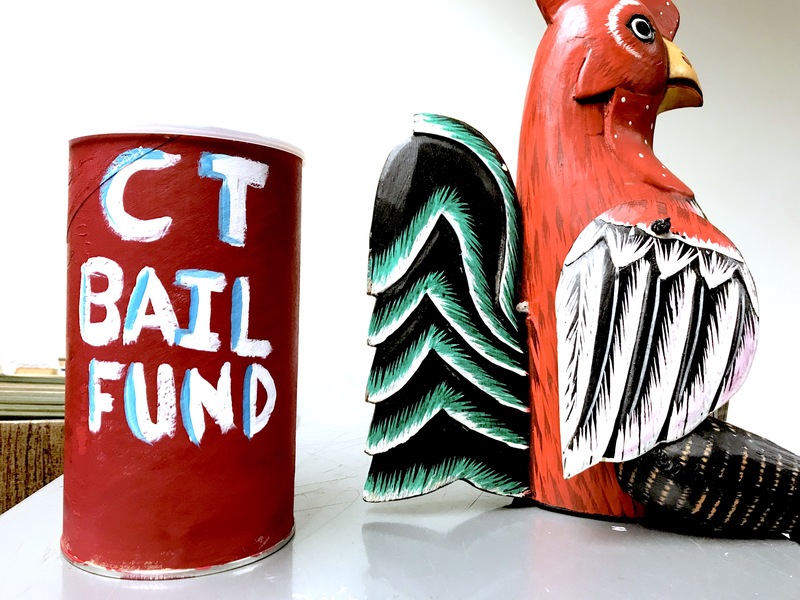 The newly formed chapter of the Young Democratic Socialists of America has partnered with the Connecticut Bail Fund to fundraise and educate the Trinity College community about Connecticut’s cash bail system and the disproportionate impact that system on low-income residents. In a Common Hour Event back in November, students learned that in legal theory bail is supposed to incentivize court appearance– it’s not supposed to be a punishment. But, the average bail for a person in Connecticut is $120,000. So, YDSA members hit the ground running— they took turns hosting bake sale tables, flyering on campus, and knocking on faculty doors to spread the message. Read more on our guest blog post by Brooke Williams ’19. Please join the Community Action Gateway for an open class. This one-time event will be hosted by Michelle L. Day, Doctoral Candidate, Rhetoric and Composition Ph.D. Fellow, Cooperative Consortium for Transdisciplinary Social Justice Research, University of Louisville. Michelle Day will discuss how trauma-informed approaches are crucial for ethical community engagement, address key barriers and opportunities for implementing trauma-informed principles and practices in community spaces, and leave participants with suggestions and resources. 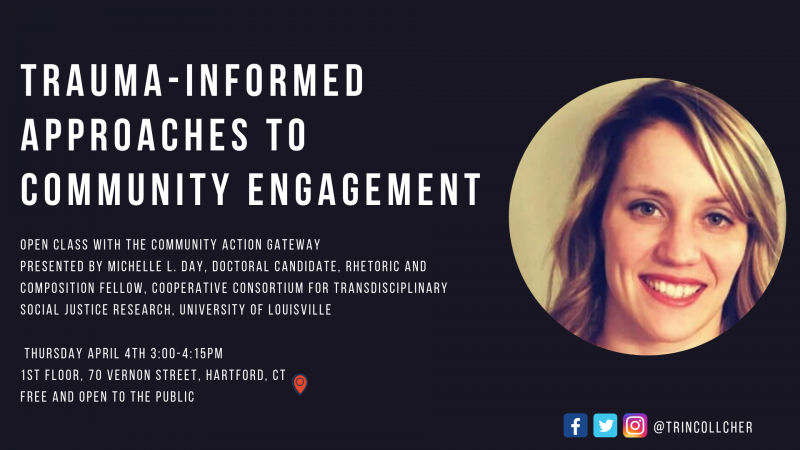 This event is free and open to the public, and will likely interest Faculty members interested in community engagement as well as Hartford community partners. Thursday April 4th, 3:00-4:15pm, 1st Floor 70 Vernon Street, Hartford, CT. Find more information and RSVP here. The “Writing with Community Partners” workshop will take place during The 2019 UConn Conference on the Teaching of Writing at the Hartford Public Library on Friday, April 5, 2019 from 2:00-4:30 pm. Faculty, students, and community partners will learn about pedagogical and organizational strategies to create reciprocal partnerships that engage students in active learning beyond the classroom and help community organizations reach their goals. Register at the UConn Writing Conference website by March 28th. Find more information here. The 14th Annual Trinity International Hip-Hop Fest will be held March 29th-March 31st in Mather Hall on Trinity College’s campus, headlined by OSHUN. This festival brings together hip-hop artists, academics, activists, and fans from dozens of countries. Students and Hartford residents will have the opportunity to attend performances, film screenings, workshops, lectures, and panel discussions throughout the weekend. Find more information and the schedule here. March 25, 2019 from 6-8pm. Professor Byrne, from the Visual Arts Department at Trinity College, will lead the workshop and teach attendees how to paint a landscape through acrylic paint. Supplies will be provided. Snacks and refreshments will be served. At Trinfo.Café. Wednesday March 27th from 5- 7 pm. Trinity College’s Black Women’s Organization is presenting Movie Night @ TRINFO Cafe! There will be free popcorn and snacks and a wonderful featured popular film that you don’t want to miss out on. SINA seeks nominations for the 2019 SINA Neighborhood Service Awards. SINA recognizes individuals who have made outstanding contributions to Hartford’s southside neighborhoods. Nominees may include community volunteers, fire fighters, agency board members, social workers, store owners, teachers, and more. Nominate online at www.sinainc.org/nsa2019.